At least 86 Texans' convictions were overturned between 1989 and 2011. A Tribune analysis finds that in nearly 25 percent of those cases, courts ruled that prosecutors made mistakes. The Texas Tribune analyzed 86 overturned convictions, finding that in nearly one quarter of those cases courts ruled that prosecutors made mistakes that often contributed to the wrong outcome. This multi-part series explores the causes and consequences of prosecutorial errors and whether reforms might prevent future wrongful convictions. 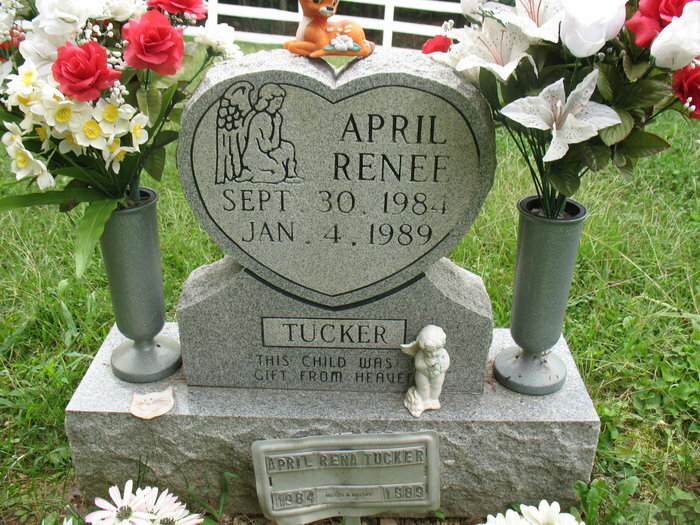 From the moment 4-year-old April Tucker died, Debbie Tucker Loveless and John Harvey Miller told police and prosecutors that she had been mauled by dogs. But in 1989, the couple was convicted of murdering her and sentenced to life in prison. Four seemingly endless years later, in 1993, the Texas Court of Criminal Appeals overturned their convictions, after a state district judge ruled prosecutors had withheld critical evidence that vindicated the couple. In the cases, judges found that prosecutors broke basic legal and ethical rules, suppressing important evidence and witness testimony and making improper arguments to jurors. Despite the courts’ findings of some serious missteps, the State Bar of Texas reports very little public discipline of prosecutors in recent history. The State Bar does not track discipline of prosecutors separately from other lawyers. But Linda Acevedo, the chief disciplinary counsel for the State Bar who has been at the agency since 1985, said she could recall three prosecutors who were publicly reprimanded. None of the reprimands were related to the 86 wrongful convictions. “Right now, there is next to no oversight of what prosecutors do,” said Jennifer Laurin, a professor who teaches criminal procedure at the University of Texas School of Law. Loveless was overwrought when Laura Ardis met her inside the Gatesville women’s prison in 1993. Four years after she had been convicted of beating and stabbing to death her 4-year-old daughter, Loveless still grieved for the girl and remained adamant that she did not kill her. Loveless told Laura Ardis and her husband, lawyer Robert Ardis, the same story that Loveless’ husband had recounted from the Huntsville prison unit. A pack of frenzied dogs, they said, had attacked April Tucker, who was bleeding to death when the couple found her in the woods near their home. Robert Ardis was appointed to represent the couple after their 1989 conviction. Laura Ardis, who was his legal assistant, was convinced of their innocence. But Hopkins County Assistant District Attorney Alwin "Al" Smith had convinced jurors that the couple cut April with a hunting knife and beat her with a curling iron. The jury sentenced the two to life in prison. Soon after he began investigating the case, Robert Ardis discovered 38 photos that prosecutors had not copied for the couple’s lawyers during trial. He tracked down doctors and animal experts who said the photos — which showed bruises in the shape of paw prints and dog hair on April's body — confirmed Loveless and Miller’s version of what happened. “This is not a case of child abuse unless you want to call it a case of animal abuse of a child,” said Dr. Charles Petty, a former Dallas County medical examiner, who examined the photos. In a 1993 finding, state district Judge Lanny Ramsay said the couple fell victim to Smith’s decision to withhold critical information that made it impossible for defense lawyers to present an effective case. The prosecutor disputed the allegations, arguing he provided the couple’s lawyers with access to the evidence. But the Texas Court of Criminal Appeals overturned the convictions that same year. High-profile cases have recently brought national attention to the issue of prosecutorial misconduct of the kind alleged in the Loveless-Miller case. In Louisiana, the U.S. Supreme Court overturned a $14 million jury award for John Thompson, who spent 14 years on death row because prosecutors withheld evidence. The high court ruled that prosecutors were immune from civil liability for their errors. 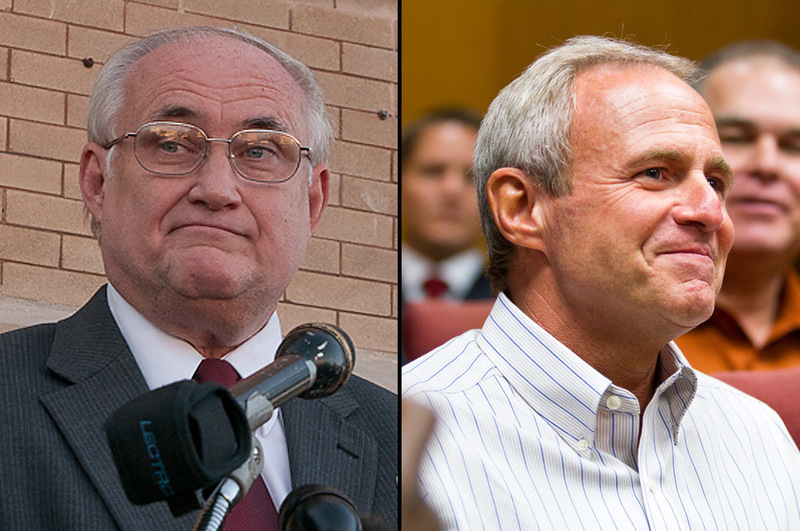 In Texas, the case of Michael Morton has sent shockwaves through the criminal justice system. Morton spent nearly 25 years in prison for his wife’s 1986 murder in Austin. DNA evidence led to Morton’s exoneration last year, and to the arrest of the man who is now facing trial in the murder. During their investigation, Morton’s lawyers say they discovered that the prosecutor did not disclose key evidence at trial that pointed to his innocence. This fall, an unprecedented legal inquest is set to determine whether the prosecutor-turned-state district Judge Ken Anderson will face criminal charges for his role in the wrongful conviction. Anderson says he did nothing wrong. Williamson County State District Judge Ken Anderson and exoneree Michael Morton. In the aftermath of those cases, lawmakers, defense lawyers and prosecutors in Texas are debating prosecutorial accountability and criminal justice reforms with an eye toward the 2013 legislative session. Defense lawyers and reform advocates argue that attorneys for the state wield an immense amount of power that goes largely unchecked even in cases of egregious misconduct. The public, they say, is becoming increasingly leery of a justice system that safeguards the death penalty, yet doesn't hold accountable the prosecutors who argue for it. They say it is just as disconcerting for people to see a system that allows killers to go free while innocent Texans languish behind bars. 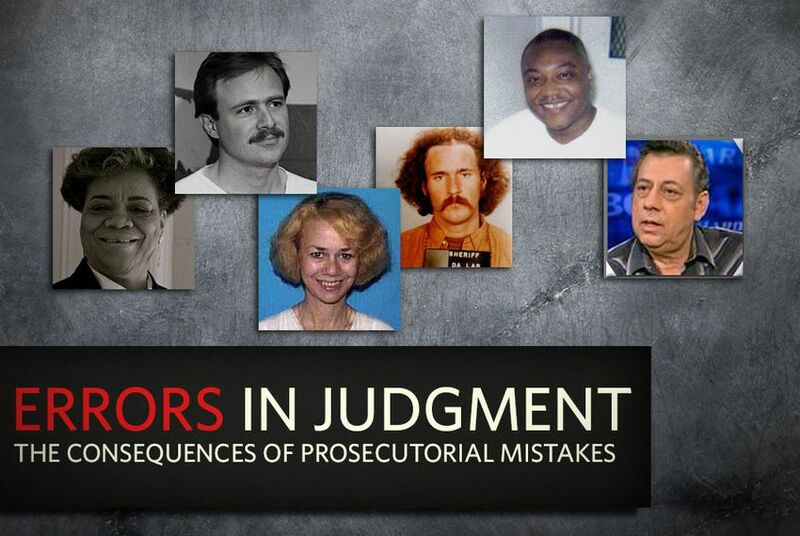 But many prosecutors say that serious, intentional mistakes are rare. Most of the court rulings have found only errors that are not tantamount to misconduct. And many prosecutors argue that internal mechanisms in the legal and judicial system already adequately punish bad actors in rare instances of misconduct. “There’s a lot of folks out there really straining too hard to overstate the extent of the problem,” said Rob Kepple, executive director of the Texas District and County Attorneys Association. In Texas, as in most other states, prosecutors are generally bound by the same ethical rules and criminal laws as private lawyers. But the Texas Disciplinary Rules of Professional Conduct set out additional requirements for lawyers for the state. “A prosecutor has the responsibility to see that justice is done, and not simply to be an advocate,” the rules state. Among those is an expansion of the so-called Brady Rule, named for the 1963 U.S. Supreme Court decision that requires prosecutors to provide defendants with exculpatory evidence — information that could help prove their innocence. In 17 of the 21 Texas cases where courts found prosecutorial error, the judges ruled that prosecutors failed to give defense lawyers exculpatory evidence. In some instances, like the cases of Loveless and Miller, prosecutors allegedly withheld crucial documents. Judge Ramsay faulted Smith, the assistant district attorney, for failing to provide the couple’s lawyers with copies of autopsy and emergency room photos of the girl. After Robert Ardis was assigned to the case, he and his wife visited Miller in prison. 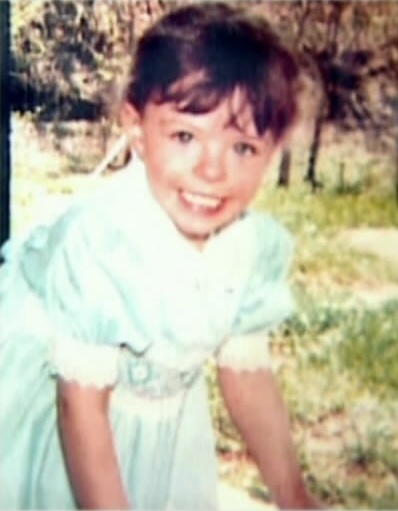 Miller told them that when he found April bleeding to death near their home, the girl said that dogs had attacked her. The Ardises promised Miller they would investigate his theory. Robert Ardis demanded that prosecutors show him photos from the autopsy and emergency room where April was treated. The Ardises made copies and showed the photos to doctors and animal experts. Dr. Charles Odom, a medical examiner who worked in Hawaii and in Dallas, testified that a dog attack was the “only reasonable interpretation” of the evidence. The Ardises also discovered testimony from a social worker, who said she witnessed attacks by the same dogs that were suspected in the girl’s death. Because prosecutors failed to divulge that information, Ramsay ruled, the couple’s original defense lawyers were left with little ammunition to refute the state’s theory that the couple methodically carved the girl’s body and used push-pins to make the fatal abuse look like a dog attack. "The jury got it right"
Nearly two decades later, Smith, the lead prosecutor in the case, said Ramsay was wrong, and that he objects to the allegation that he withheld evidence. In objections filed with the Texas Court of Criminal Appeals, Smith said he never received reports of other attacks by the dogs. And he said in an interview that he allowed attorneys for Loveless and Miller to look at every photo he had. The problem in the case, Smith said, was that during the trial, Ramsay did not provide the couple with funds to hire experts to review the evidence. That, he contends, is the real reason Loveless and Miller were freed — which he still believes was a mistake. Soon after the Loveless-Miller case, Smith moved on to become trial chief for the Bowie County Criminal District Attorney and an assistant U.S. attorney in the Eastern District of Texas. Now, he is in private practice in Texarkana. Smith said there’s nothing he would have done differently in the Loveless-Miller case, and he has talked with the current district attorney about trying the couple again. More than half of the overturned convictions in which courts found prosecutorial error were murder cases, 13 in total. And in six of those cases, the defendant was freed from death row. Among the cases with findings of error, the shortest sentence any defendant received was 20 years. 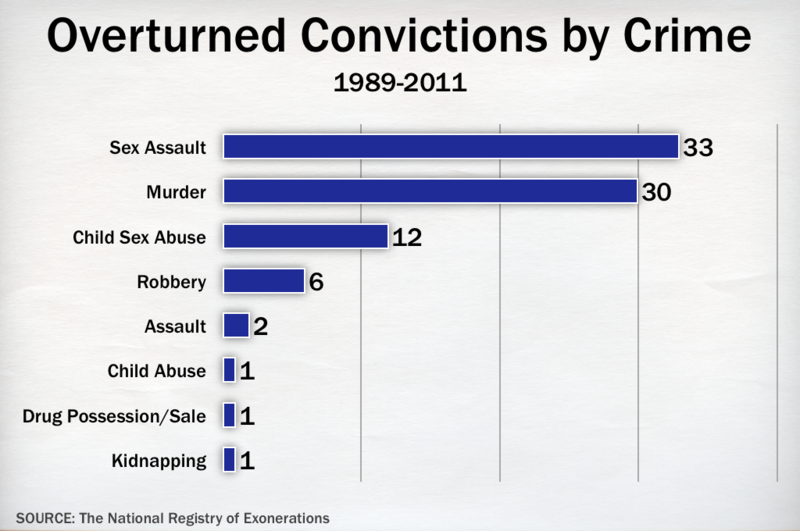 Source: The National Registry of Exonerations. In the case of Anthony Graves, who was exonerated in 2010, the U.S. 5th Circuit Court of Appeals found that Burleson County District Attorney Charles Sebesta never told defense lawyers that another man, Robert Carter, confessed that he was the sole killer in the massacre of a Somerville family. Both Graves and Carter were sentenced to death. Graves spent 18 years in prison — 12 on death row, where he twice neared execution — before prosecutors dismissed the case against him because of a lack of evidence. In his final statement before his lethal injection in 2000, Carter again took full responsibility for the crime. Still, Sebesta has stood by his work in the case. Despite the decades that innocent men and women have lost behind bars, none of the prosecutors involved were publicly disciplined. The absence of a public reprimand, though, doesn’t mean none of the lawyers were disciplined. Lawyers can also be reprimanded privately. A grievance process is triggered whenever someone files a complaint with the State Bar. Complaints, which can be filed by anyone, are screened, and lawyers are given 30 days to respond to misconduct allegations. If the bar determines misconduct may have occurred, a lawyer can choose to have a hearing in district court or with a local grievance committee. The only time any of those proceedings become public is when the bar issues public sanctions, which include reprimands, suspensions or disbarments. The bar can also mete out private disciplinary measures, but because the proceedings are secret, there’s no way to determine how many times such measures have been taken in cases involving prosecutorial misconduct. Betty Blackwell, an Austin criminal defense lawyer who has served on the State Bar’s Commission for Lawyer Discipline, said the oversight agency works hard to ensure that lawyers don’t abuse the public trust. But she said the nature of wrongful convictions combined with state laws that limit prosecutors’ liability for the errors make it difficult for the State Bar to take action. Hidden exculpatory evidence typically isn’t uncovered until many years after a conviction is handed down. By then, the four-year statute of limitations on prosecutorial ethics violations has generally expired. Additionally, because the cases are old, memories of the details have often faded. Prosecutors may have moved on, and, particularly in large district attorney's offices with dozens of litigators, it’s hard to know who did what in a case and when. And Blackwell said prosecutors aren’t publicly admonished simply for making mistakes, even when the mistake results in an overturned conviction. The bar rules require proof that the lawyer intentionally behaved unethically. “Just because a case was reversed for failure to turn over Brady evidence doesn’t mean there was an ethical violation,” Blackwell said. Whether the combined errors that led to the convictions of Loveless and Miller were ethical violations or not, Laura Ardis said, the result was heart-wrenching for the couple. Not only did they grieve over April's death, but the couple also spent four years separated from their older children, who lived out of state with relatives. After Loveless and Miller were freed, Laura Ardis said, the two separated and moved on with their lives. Over the years, they lost touch with the Ardises. For Robert Ardis, who has Alzheimer’s disease, his work on the case remains one of his proudest accomplishments, his wife said. He keeps an award for it on the wall of his nursing home room. And Laura Ardis holds fast to the memory of the happy day when the couple was released from prison. Reporters and TV cameras clamored around their small law office. The owners of the western wear store next door to the law firm told Loveless and Miller they could pick out any new clothes they wanted for the day. Loveless and Miller were reunited with their children, who had grown into teenagers. “It was just amazing that day,” Laura Ardis said.